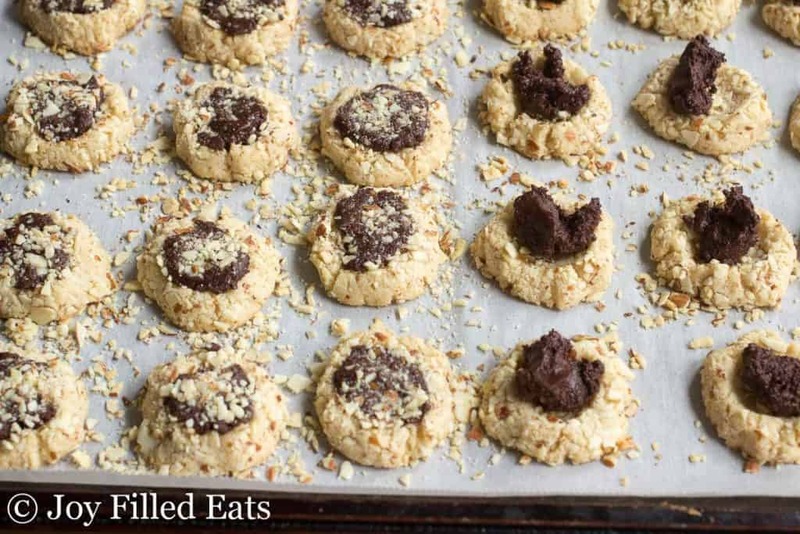 These Almond Crunch Chocolate Thumbprint Cookies melt in your mouth like shortbread, have the crunch of almonds, and the richness of chocolate ganache. They are the perfect holiday bite. Hello, cookies! 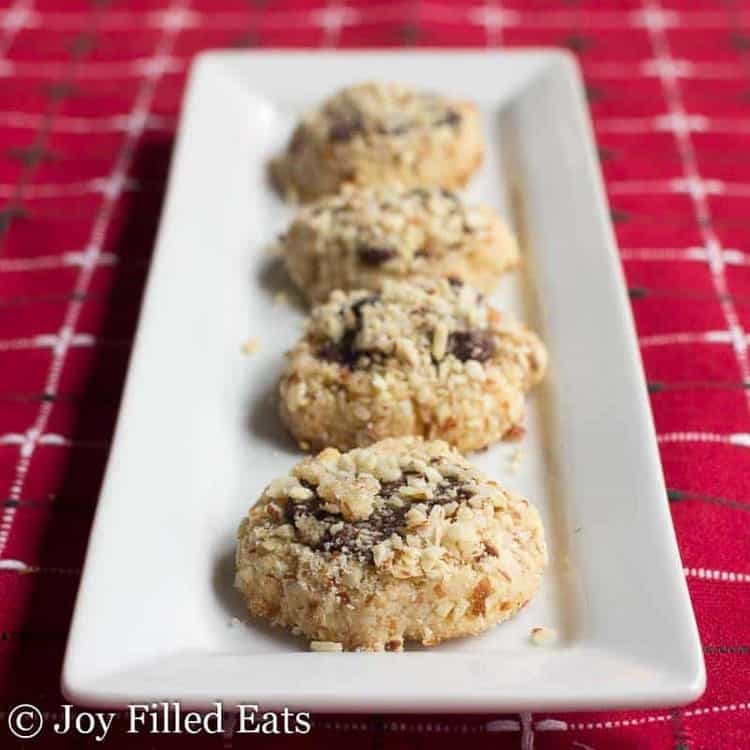 I (somewhat crazily) decided to try to post 12 new cookie recipes between now and Christmas. 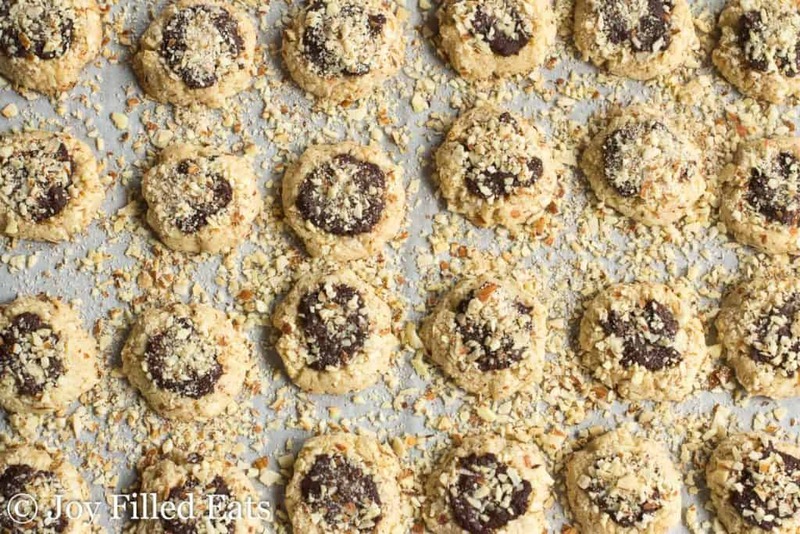 These Almond Crunch Chocolate Thumbprint Cookies are the first. If the rest are even half as good as these I’ll be happy. I began baking at around 9 am the other morning and baked nonstop until noon. I skipped breakfast and taste tested along the way. That is one of the challenges of being a food blogger. There are just too many yummy things to taste. Cookies for breakfast happen a bit more than they should. Don’t worry; I saved all those little pieces of almonds that fell off the cookies. I sprinkled them on top of chocolate ice cream this afternoon. I know you’re jealous. 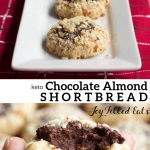 You can just make these as almond crunch cookies without any filling. They are delicious just like that. Sprinkle them with a little powdered sweetener and serve with a cup of tea. If Jam Thumbprints are more your thing don’t worry. You can click on my recipe for the classic Jam Thumbprints. 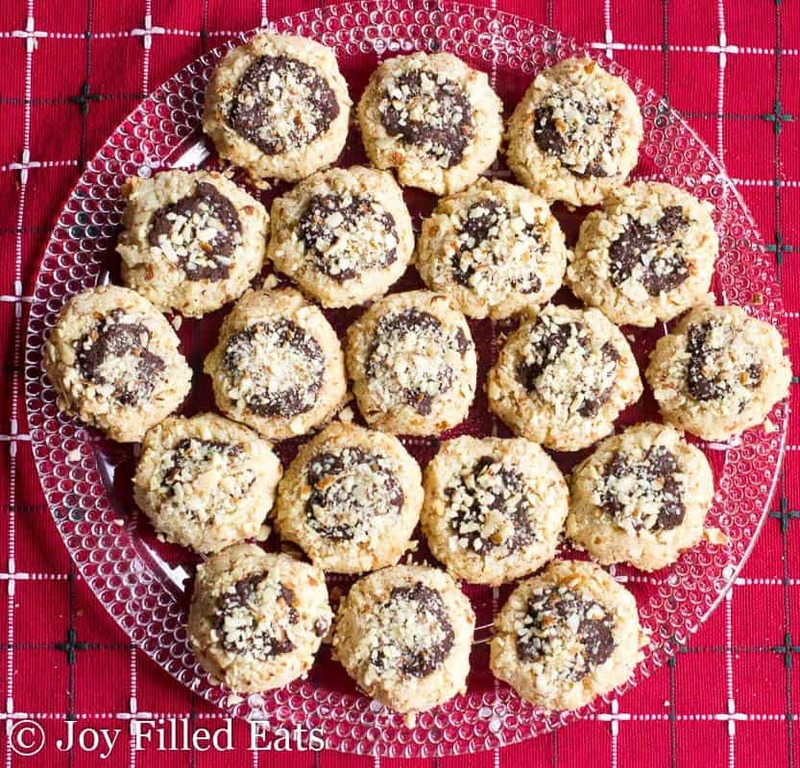 I hope these chocolate thumbprint cookies will find their way onto your next cookie tray! Combine the 2/3 cup sliced almonds and 2 tsp sweetener in a food processor and pulse into chopped. Transfer to a small bowl and set aside. Next, combine all the dough ingredients in the food processor and pulse until a uniform dough forms. 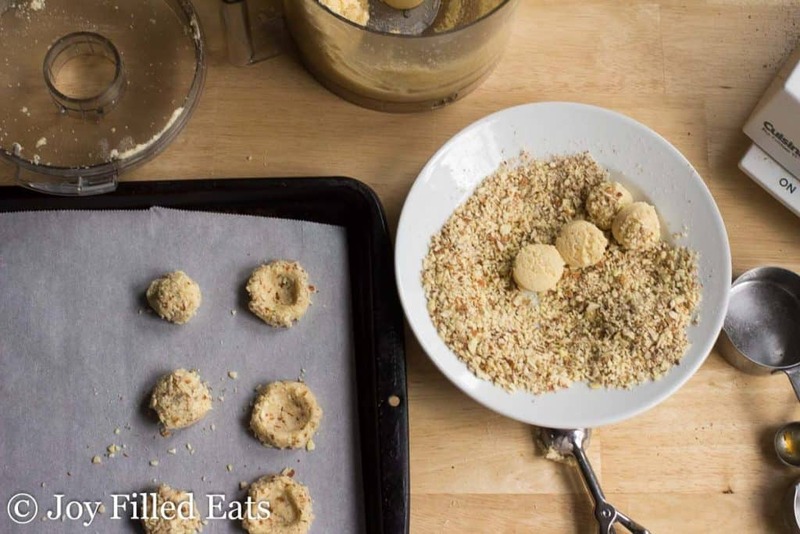 Divide into 24 balls and roll each in the almond topping. 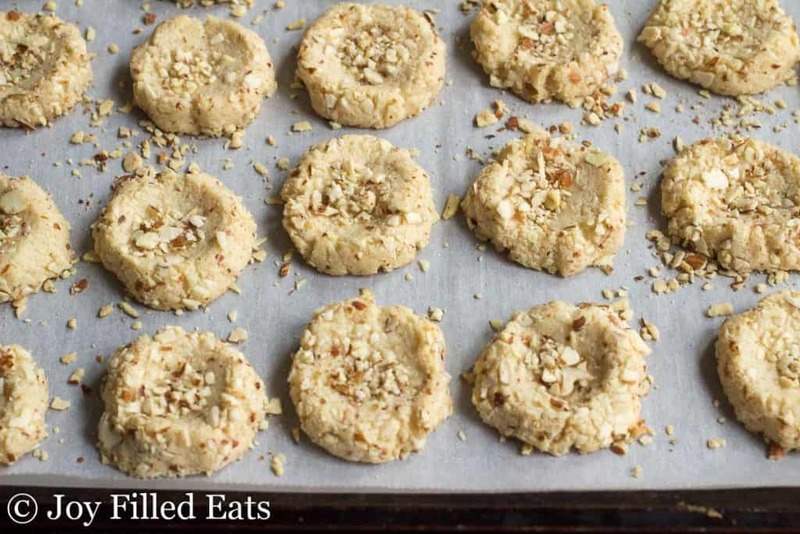 Put on a parchment lined baking sheet and press down making a little well with your thumbs. Sprinkle a little more almond topping on each. Meanwhile, put the chocolate chips and heavy cream in a microwave safe bowl and heat for 30 seconds. Stir. Heat for another 30 seconds. Stir. 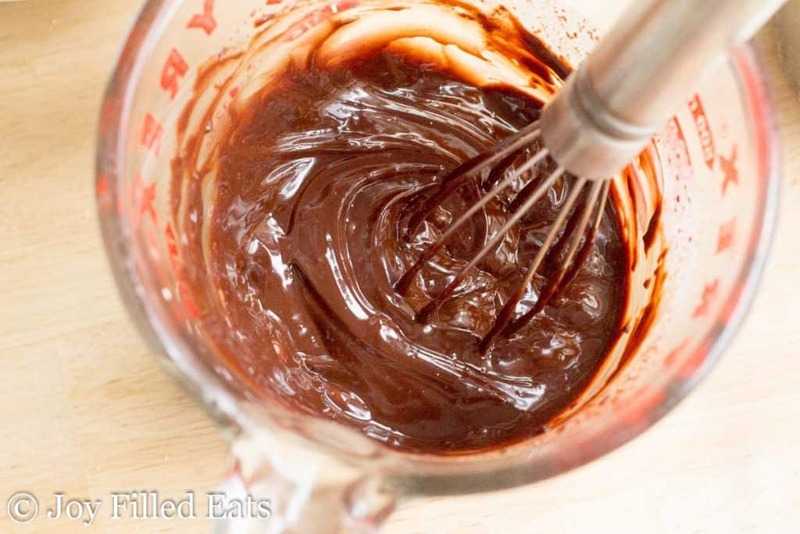 Repeat until the chocolate has melted. Stir until smooth. 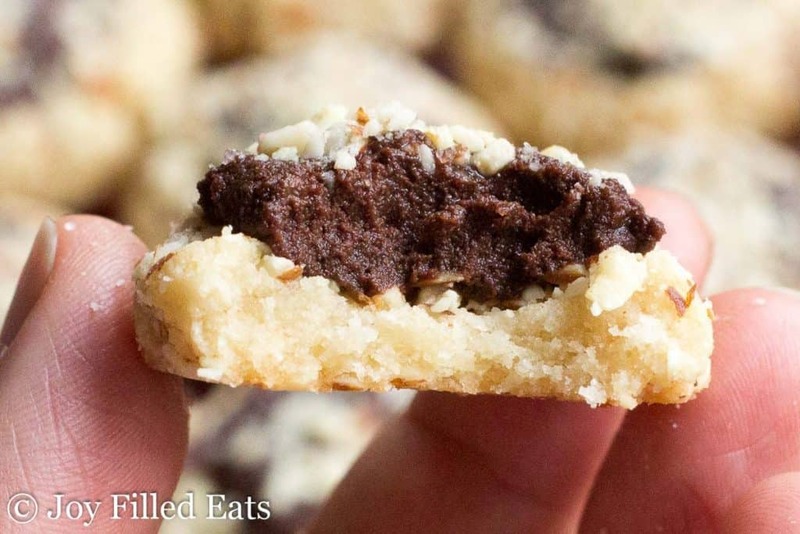 Divide the chocolate ganache between the thumbprint cookies. Sprinkle with a little more of the chopped almonds. I made these today. I wanted the almond crunch but with a jam filling....used sugar free raspberry jam for the filling on half the batch (other half was the ganache)...…..soo good. Thank you for such a great recipe. THANK YOU! These cookies are school friendly! 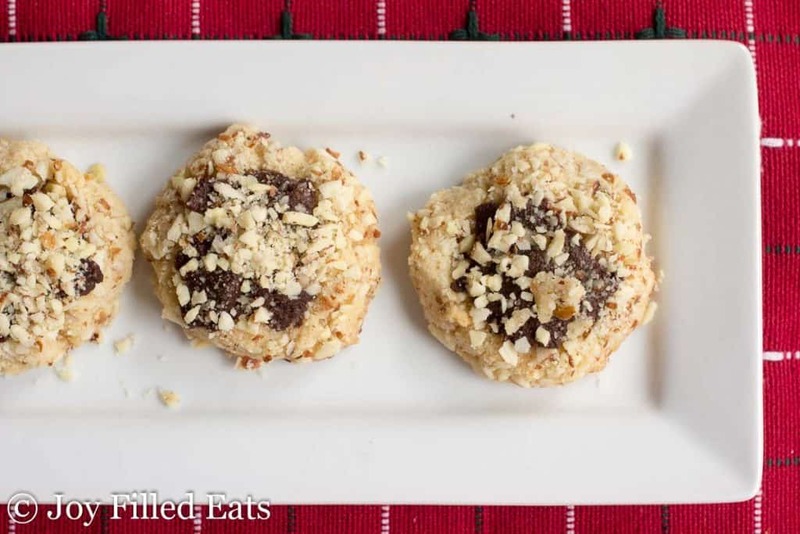 Thumbprint Cookies are some of my very favorite cookies! I am super excited to try these out! Can I use Lindt chocolate bar cut up instead of sugar free chips? I’m excited to try these! I love all your recipes, Taryn. You seem to like the same level of sweetness as I do, and your recipes always turn out great for me. Thanks for taking the time to share with us all! God bless you! I made these this afternoon. The dough did not turn out right, it was like pea sized chunks, like when you cut lard int a flour for a pie crust, I also baked them for 10 minutes and they were almost to burnt to eat. Any ideas on what happened? This is the second recipe I have tried that has failed. Hi Shari, I'm not sure what happened. Were you precise in your measurement of the coconut flour? That will make a big difference. I've made this dough about a dozen times and have had many readers make it successfully. Perhaps your oven temp is off as well? I used 1/3 cup coconut flour precisely and I have an oven thermometer that said 350 degrees. I have no idea what happened. The dough was where it all started to go down hill. I will have to try this again and see if I get different results. Thank you. I've enjoyed making a number of the cookies with this base. So far, my husband's favorite is the lemon, followed by this one, and the mint third. My oldest liked the chocolate dipped chocolate chip shortbread the best. 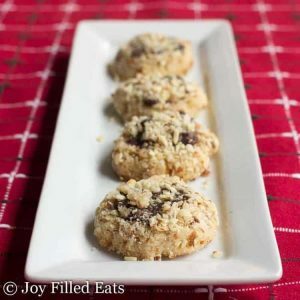 I'm making the pecan ones for myself soon, maybe I'll share. Maybe not. ? Can I use Swerve in place of your sweetener? 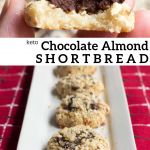 I am trying to make these right now but they are so dry the dough doesn't stick together. Any suggestions? Followed directions as written down. Are you using the almond flour and coconut flour or another blend? I've made this dough 5 times in the last week and it has always worked for me. Yes I am using almond and coconut flour. We don't use stick of butter as reference in Canada but i looked it up to be 1/2c. Is that correct? It's just really crumbly. Wish I could add a picture! Was excited to try them. Yes, 1/2 cup or 4 oz. I'm not sure why your dough isn't coming together. I've had a few people make these already. When processing it it does start off crumbly but will come together. Maybe you needed to process it longer? I did use my big mixer to mix it as I don't have a food processor. I didn't think it would matter but maybe it does. Thank you for answering me with such quick responses. I don't like to waste these kinds of ingredients so thought if my mistakes can help some one else not make them then that's a good thing. Will see what I can do. For the gelatin, is that the unflavored one you buy that is next to all the jello items ? The ones I have are in little packets which I measure out of ..Thanks and I can't wait to make these.. Yes, I used the Knox gelatin. I bought a bigger canister off of Amazon but it's the same stuff.